Mantle convection is the source of all tectonic motion, and because it controls the temperature regime in the mantle and through it the heatflow into the Earth's crust it is also fundamental to the long-term (geologic) thermal evolution of the Earth and planets. 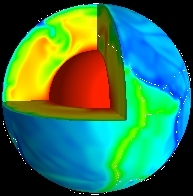 The Munich Geodynamics group develops and maintains the TERRA code, one of the most sophisticated global mantle convection models. This finite element model, fully parallelized and based on a highly efficient multigrid solver, is capable of handling large spatial variations in material properties (i.e. viscosity) and allows for lagrangian tracking of material through a particle in cell (PIC) method. Currently we apply this code to study the long standing problem of the supercontinent (so called Wilson) cycle, the partition of internal (radioactive) and core heat in the energy budget of the mantle, and problems of the thermal evolution of Earth and Mars. Magneto-Hydro-Dynamic (MHD) convection in the fluid outer core is the source of the Earth's magnetic field through a complex dynamo process. Although Albert Einstein declared it one of the ten most important unsolved problems in modern Physics, studying dynamo action both in laboratory experiments or with computer models has proven to be difficult. The difficulty arises because dynamo processes by their nature (Cowling theorem) must be studied in 3 dimensions, and because one must simultaneously resolve a large range of spatial scales (ranging from meters to the dimension of the core). 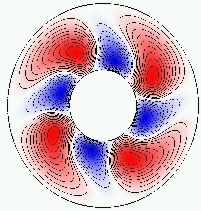 Consequently numerical dynamo models should be developed for modern parallel computers, in order to take advantage of their superior compute performance. In collaboration with our former Ph.D. student Alexandre Fournier, now a professor at Grenoble University (France), and Rainer Hollerbach (Faculty at Glasgow University, UK) the Munich Geodynamics group is involved in developing a grid-based dynamo model, using a mixed Spectral Element - Fourier approach. The model is optimized directly for modern PC-Networks (so called Beowulf Clusters), one of the most cost-efficient high-performance compute platforms curently available. A fundamental problem in Geodynamics arises from the fact that many observational constraints available to us (like seismic tomography, the Earth's geoid, and geochemical measurements for the Earth's mantle, or secular magnetic variations for the Earth's core) are by their nature tied to an initial condition some time in the past. Because this initial condition is necessarily unknown, geodynamicists cannot hope to exploit these observations in their conventional (forward) models. Adressing this fundamental problem the Munich Geodynamics group has pioneered novel data assimilation methods for geodynamic models. Our group is leading an international effort in this exciting, and fundamentally important new field. For example, we developed for the first time the (inverse) theory required to formally pose the initial condition problem in Geodynamics. We also developed and implemented the first geodynamic model with variational data-asssimilation. By their nature geodynamic inverse models are compute intensive. Hence they are only beginning to become feasible on modern parallel PC-networks. An interdisciplinary effort including observations and data selection, inverse theory, and numerical methods and high-performance computing is needed to advance the state-of-the-art. Building on their unique strengths the Munich Geodynamics and Seismology groups have teamed up to start exploring seismic wave propagation through geodynamically consistent Earth models. This work also includes Prof. G. Steinle-Neumann from the Bayrische GeoInstitut (BGI) in Bayreuth, who is involved in the mineral physics aspects of mapping geodynamically derived pressure, temperature (P,T) information to the elastic constants probed by seismic observations. We emphasise the long-term nature of this project, which involves collaboration with many research groups world wide, and offers unique opportunties for demanding Ph.D. projects. The Munich Geophysics group has been engaged in modern parallel computing based on message-passing and using distributed networks of (initially) Unix workstations and later PCs (Beowulfs) since 1991. During the past six years alone two large-scale (more than 100 processors) PC-Clusters with generous funding from the National Science Foundation (NSF) were built within this international project. 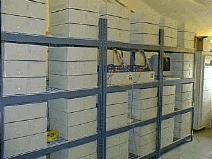 The Beowulf cluster at the Princeton Department of Geosciences - named "Geowulf" - was the first NSF funded PC cluster dedicated solely to geophysical modeling. The now iconic design has since been used by many other groups worldwide, and had important impact on the ongoing development of a geophysical modeling infrastructure. Geowulf with initially 136 Pentium II processors and a 100-BaseT fully switched Ethernet was completed in 1999. It is still operational today. A second high-end PC Beowulf, based on 130 Pentium IV nodes and cascaded Dell Gigabit switches was built in 2003. This machine, named "Bladerunner", is currently the main workhorse for our geodynamo modeling. We are currently building a large-scale modeling cluster in the Department of Earth and Environmental Sciences at Munich University. The new machine will serve as prototype TOPICAL COMPUTE FACILITY targeted directly at high-end geophysical computing. We are actively involved in a number of high-performance computing and IT-related projects. These include visualization, data-storage and management, as well as numerical and parallelization questions.